Wilson James is a leading security, logistics and business service provider. Founded in 1991, we deliver solutions that enable clients to focus on achieving their core business objectives. In 2005 Wilson James established The London Construction Consolidation Centre (LCCC). Its primary aim is to provide a more efficient method of delivering material and equipment to construction projects located in Central London. The LCCC can be used for a range of off-site logistics support for construction projects including: both forward and reverse logistics, waste management, mock ups, quality samples and off site fabrication. ‘My name is Sukh Gill, as the LCCC Transport & Compliance Manager I oversee a fleet of seven LGV’s which are managed through our Fulcrum system’ Since joining FORS Wilson James (LCCC) have achieved a significant reduction in fuel usage through good practice measures including; Low-emission trucks (Euro 6), tracking systems for efficient routes to site, no idling policy, driver training including external courses, WJ & FORS toolbox talks, and the FTA tacho software to monitor driving patterns. Wilson James has a long standing commitment to FORS with key involvement at early stages of its development. We quickly recognised the importance of FORS with major improvements to safety and significant reduction in fuel and emissions. After our initial assessment for FORS bronze was passed first time, we became one of the first companies to obtain the silver accreditation in 2009. We continue to maintain the highest standards by retaining our Gold accreditation. Once we achieved bronze the LCCC benefitted from a more professional, marketable and healthy transport operation. One benefit in particular as a FORS member is our drivers have access to the excellent toolbox talks which help promote safety, efficiency and environmental awareness. We’ve seen many benefits and improvements as a company with our FORS accreditation, this has greatly assisted us in improving overall safety standards, efficiency and environmental improvements. The supply chain has been strengthened as we continue to deliver an improved effective service. Safety critical medicals are carried out on a yearly basis in conjunction with driver risk assessment forms which establish the risk band of each individual driver. These RA forms have recently been updated to cover driving in and around London. 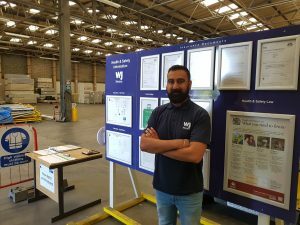 New drivers are assessed by our WJ senior drivers by going together to visit the various sites we serve, going forward the transport and compliance manger Sukh Gill will be fully trained (ROSPA) to assess new drivers. As a company we have also taken the decision to upskill our current workforce and a member of the warehouse team is undergoing training, this will reduce the reliance on agency drivers and enforce the good practice already imbedded in the member of staff. Noise risk assessments and tool box talks have been carried out at the LCCC to emphasise the importance of noise pollution. All drivers are fully aware of the WJ Policy Statement ‘Good Neighbour’ and the fact that the LCCC is a ‘No Idle Zone’. As part of our continual improvements at the LCCC we’re upgrading our whole fleet to Euro VI by the summer of 2018. The company have also looked at the options for alternative fuelled vehicles namely electric. Members of our team including drivers have been to various Lo-City events and the recent freight in the city expo at Alexandra Palace. The very nature of Wilson James’ business at the Construction Consolidation Centre aims to reduce the vehicle volume on our capitals roads through efficient load consolidation, thereby reducing emissions, congestion and increasing safety. 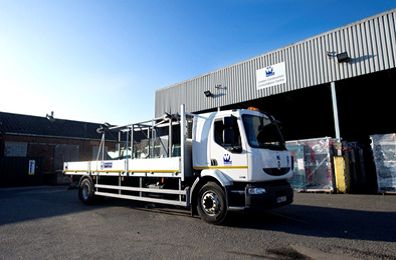 This business objective is wholly underpinned by our FORS Gold standard, we actively encourage all construction clients during all build phases to fully embrace the FORS standards and make them compulsory for site deliveries, and this mandatory compliance is then regulated by the use of our Fulcrum system.